Dual 5V/3A USB ports with PowerIQ technology offer faster charging speeds for phones and tablets. The USB-C port offers total Power Delivery support, charging compatible devices such as MacBook and Nintendo Switch (C-to-Lightning cable required for iPhone 8/iPhone 8 Plus). 26800mAh is enough to keep your phones and tablets charged for a week or give your USB-C laptop over 1 full charge. 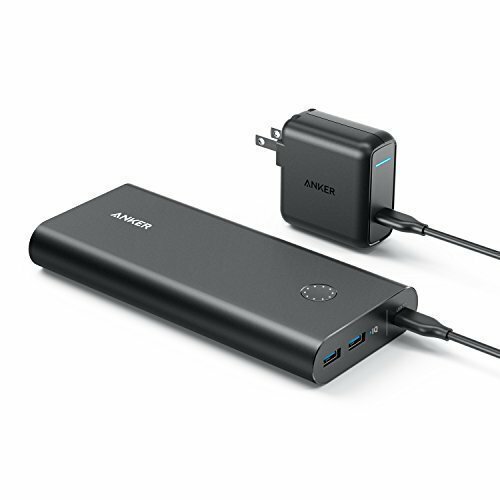 Using the included USB-C wall charger, PowerCore+ 26800 PD utilizes a huge 27 watts of power to fully charge in just over 4 hours. That's 3x faster than other portable chargers of this capacity. Anker's MultiProtect technology combines surge protection, short circuit prevention and premium LG battery cells to keep you and your devices safe. -Incompatible with HTC 10, HP Spectre and Dell XPS 13, as well as Lenovo ThinkPad 470s and ThinkPad X1 tablets. -Nintendo Switch will not charge when connected via HDMI. -Some USB-C laptops which require an input over 30W may not be compatible. -Tested compatible with USB-C MacBooks. Recharge 3x Faster: Time for a full recharge is reduced to 4.5 hours thanks to Power Delivery input (27W). Compatible charger included. What You Get: PowerCore+ 26800 PD, 30W USB-C wall charger, Micro USB cable, USB-C to USB-C cable, travel pouch, welcome guide, our worry-free 18-month warranty and friendly customer service.